There is nothing to install – A tell-tale indication that a sign doesn’t use cloud-based software is if you have to download and use a desktop application to control it. This requirement will prevent you from being able to access and change your sign from any location. You will need to keep track of software activation keys should you ever switch computers, and manual updates may be required to keep your computer and sign in sync. It doesn’t use intermediate software – Related to the above, some companies will just provide a web browser interface that communicates to their regular sign software. This requires that the computer with the installed software is always up and running, 24-hours a day, which adds a point-of-failure that can quickly turn into a disconnected sign. Should there be a power interruption, software crash or simply a turned off machine, it will prevent you from updating your sign. It uses an industry-leading cloud host – Some companies will host their application on their own personal servers to save money. As more users and signs are added, these private servers cannot scale quickly to meet demand. These companies are also on their own when it comes to hackers, cyber-attacks, backups and server availability. The best solutions use industry-leading cloud platforms such as Amazon AWS and its many specialized services. Diagnostics and support are done over the internet – As with any technology, there can be times when some support is required. Many LED sign applications are only used to place new messages on the sign. This is fine during normal operation, but if things do go wrong it could require support access to your private network and the installation of diagnostic software. This increases the time that it takes to get your sign back up and running. 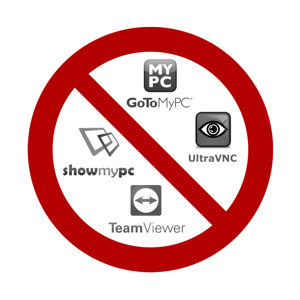 You can’t use it from anywhere – Most screen-sharing software still requires you to download and install a program on the remote computer that you want to use. If you need to control your sign from a friend’s computer or an internet café, you’re out of luck. You can’t use it on a mobile device – Screen-sharing applications typically don’t have the ability to connect with a phone or tablet. Even if they did, controlling a full-sized desktop application on a small screen is nearly impossible. You can’t turn off or lock down the computer – The computer connected to your sign needs to be on 24-hours a day with the screen-sharing program always running. This provides another way for intruders to make their way into your private network, and another failure point in communicating with your sign. You can’t give other users their own separate access – If you want to have others help manage sign content, it would require giving them access to the computer running the software. Unless you only use this computer for controlling the sign, you could be unknowingly sharing sensitive information or access to other parts of your network.